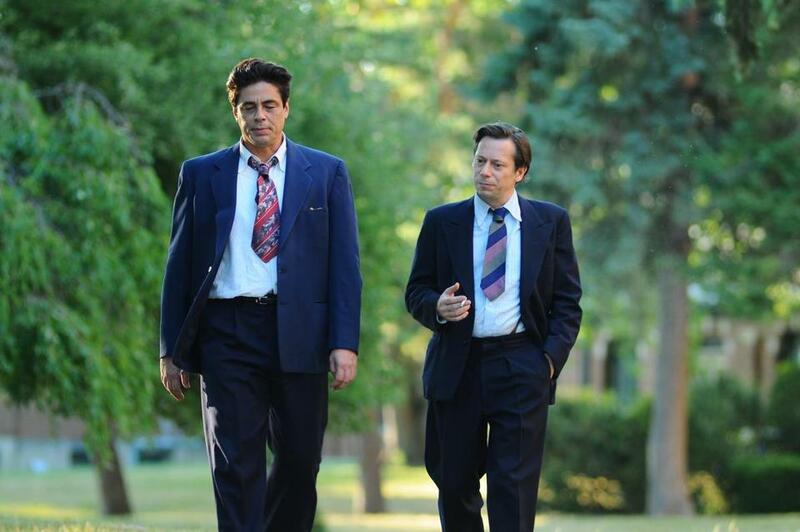 Benicio Del Toro (left) plays a Native American WWII vet, Mathieu Amalric an ethnologist. Jimmy Picard, the character played by Benicio del Toro in “Jimmy P.,” is a man thrice exiled. As a member of the Blackfeet Nation of Montana, he sits forcibly outside the mainstream of 20th-century American life. As a veteran of World War II, he has experienced traumas that remain locked up inside him. And as a patient at the Menninger Clinic in Topeka, Kan., he suffers from crippling dreams and visions that traditionally trained doctors are unable to diagnose, let alone treat. It takes an outsider, then, to help an outsider. In Arnaud Desplechin’s odd, densely satisfying film — subtitled “Psychotherapy of a Plains Indian” after the 1951 case history on which it’s based — the head of the clinic (Larry Pine) calls in an old friend, Georges Devereaux (Mathieu Amalric, “The Diving Bell and the Butterfly”). The latter isn’t a clinical psychiatrist but rather a psychoanalytic ethnologist who has lived with the Mojave tribe; he’s also a Hungarian Jew who fled Hitler’s coming and peripatetically flits between studies in England and fieldwork in the States. Devereaux is as impish and outgoing as his patient is withdrawn. Yet the two slowly find a comfort zone, Amalric scurrying verbally around del Toro like a Jack Russell around a mastiff. Because we’ve been trained by years of Hollywood story structure, we know where this movie’s going — or we think we do. But Desplechin, whose earlier “Kings and Queen” (2004) and “A Christmas Tale” (2008) helped make Amalric an international star, is a precise and observant filmmaker who has little interest in standard story beats about breakthrough and closure. He’s more curious about what these two misfits might bring to each other, and so he lets them talk. This has led some critics to label the movie “boring,” and “Jimmy P.” does have a few quiescent patches. Just because it doesn’t follow our expectations of its perceived genre — the therapy movie — doesn’t mean there’s no there there. On the contrary: There’s a lot of there there, simply arranged with more respect for its characters than for us. The meaning and use of dreams is one area of inquiry. Can Jimmy P’s be interpreted according to then-standard Freudian practice, as expressions of the subconscious, or do they function for him in a more visionary fashion? How deeply does cultural DNA affect psychology, the ways our brains make sense of things? The other matter to which “Jimmy P.” attends is the lowly status of the tribes in a postwar America not long removed from the frontier. The doctors at the Menninger clinic have the best intentions and a great deal of academic interest, and still they see Jimmy as a curiosity in a cage. Ingrained cultural racism: It’s just one more indignity Devereaux knows from personal experience. In the end, there is a kind of closure both men find, especially as it pertains to the patient’s long-ago girlfriend (Misty Upham, the caretaker in “August: Osage County) and the doctor’s playfully elegant British lover (Gina McKee). The subject, when all is said and done, is sympathy in its largest sense: how two men might find common ground over a great divide. You may leave “Jimmy P.” wondering exactly what it is you’ve just seen, but you may be equally grateful it proves so hard to shake.